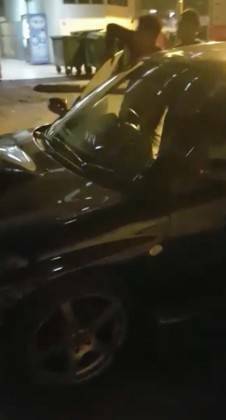 A video of two men hitting a Volkswagen car; with at least one man using an object to do so, has been circulating on social media. "Who hit who? Who hit who?" She appears to be the one filming the entire incident as well. In the video, she then shouts at the rest of her group, which consists of at least three men, to get back into the car and shut the car doors. The group then converses in the car, with vulgarities being spewed. "Damn it, whom did he (the other driver) hit?" One of the men then drives the car onto an open road before a traffic junction where the group spots a black Volkswagen. From their conversation, it seems as if the group was chasing after the Volkswagen. Two of the men then stepped out of the car, and approached the Volkswagen. One of the men, carrying an object strikes the Volkswagen, while his companion kicks the car as the driver attempts to flee in his vehicle. As the attack commences, other road users stared in shock at the mayhem unfolding. The two men then boarded their car again to give chase to the Volkswagen. 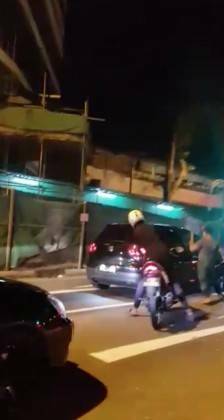 Details of the prior road incident that triggered the attack are unclear, but according to a Facebook post by SG Road Vigilante, the incident happened along Jalan Sultan. Several vehicles bearing Singapore-registered licence plates are also seen in the video, suggesting that the incident happened in Singapore. "This cam girl is going to get her friends into troubles(sic), leaving 'Road Bully' evidence for the police! "This video does not help in the "hit & run" case but only show her friends trying to attack the Volkswagen car, using their own way. "Friend sabo friends.....use your brain first before u post on the net." "The Police confirm a report was lodged and investigations are ongoing. "Anyone with information on the incident is requested to call the Police Hotline at 1800-255-0000 or submit information online at www.police.gov.sg/iwitness. All information will be kept strictly confidential." Stomp has edited the original video to remove the vulgarities.